During the aftermath of any breakup, many people find the no contact rule can often be a helpful approach to give yourself some space to have some thinking time, to grieve, and to heal. Going through a breakup is an emotionally taxing process for anyone. Even if you knew that the end was near, the chances are that you’re still having difficulties accepting the changes in your life. The no contact rule is one of the options people often use in order to heal faster, get over the relationship and move on with your life. However, some people do also use this technique by way of manipulation in the hopes that it will cause their now recent ex to miss them and think them. That aside, here’s how it works. 1 What Is The No Contact Rule? 1.1 When Is The No Contact Rule Appropriate? The name is pretty self-explanatory – the no contact rule refers to refraining from any kind of communication with your ex after a breakup. Anyone can choose a particular period of time during which to cease communication. There’s no set rule when it comes to how long the zero communication period should last. However, many relationship experts claim that at least thirty days is a good standard for which not to communicate. Once it’s really over, then any one or both of the people involved may of course not have any intentions of speaking to their ex again. However, if you did finish things on good terms and you would still like to stay in contact as friends after then, it can often be a wise move to have some space and use the no contact rule. If this is your current situation, then you may want to wait until you feel emotionally healed from the breakup before getting in contact with your ex again. 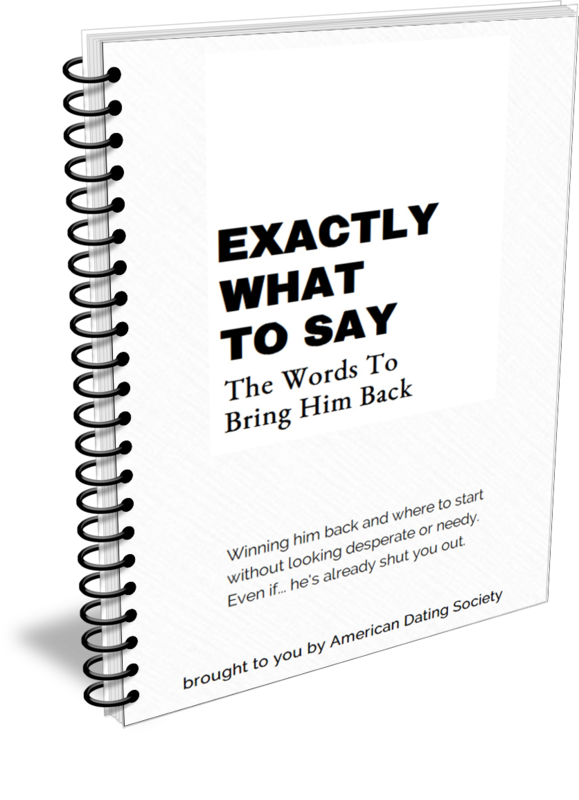 If you want to read more about this then please see our article on When to contact your ex boyfriend after the breakup. Most people implement the no contact rule by deleting phone numbers, email addresses and social media communication as the temptation will often be strong to get back in touch. Getting rid of personal information has both symbolic and practical appeal. It indicates the end of the relationship and makes it difficult to phone or text an ex after a few glasses of wine, for example, which is never a good time to contact your ex boyfriend! When Is The No Contact Rule Appropriate? Many brokenhearted girls hate the no contact rule because of the finality that it brings to the table. For many, however, it will be an absolute essential on the road to recovery. The no contact rule is appropriate in just about every breakup situation. It provides closure and helps decrease the “grieving” period that people go through after a breakup. It’s also a good solution for individuals that have a history of getting back with an ex shortly after a breakup. Most of us are guilty of making irrational decisions when in an emotionally unstable frame of mind. This is particularly the case when it comes to relationships. If your relationship has just ended, but you do really want to be with him, then the chances are you’ll do everything possible to get back with your ex. You will want answers, and you may even feel passionate about getting back together because you can’t handle the rejection. If you feel that you do want to get back together with your ex boyfriend then you may benefit from reading about the Top 7 signs you should get back with your ex. By implementing the no communication rule, you give yourself a chance to be emotional and to recover in your own space and time without making a mistake or scene in front of him. Implementing this rule after a breakup also has several other benefits. Below are a few other reasons why using this rule is usually a good idea during the aftermath of a breakup. For starters, you give yourself a chance to heal from the breakup faster than you would be able to if you were still in contact with him. Constant communication with a former partner will serve as a reminder of what you had and will also put it square in your face if he decides to get together with someone else. As a result, a person may go through an agonizingly-long recovery period. You will find it a lot easier to forget your ex if you don’t communicate. Some people take the no contact rule a step further. Apart from getting rid of contact information, they also get rid of pictures, gifts and anything else that has to do with an ex. Having no reminders about that person can also help you to get them out of your mind and to move on with your life if it feels necessary. Besides helping with the healing process, many people also use the no contact rule to make an ex miss them. Perhaps not the best reason to use this rule, it can certainly get your ex to wonder what you are doing and who you’re with if they suddenly lose all contact with you. If your ultimate goal is to get back with your ex boyfriend then implementing the no contact rule to make him miss you can sometimes work. However, it is best not to use it as a way to manipulate him into missing you. You get to decide for yourself whether you want to communicate with your ex. You also decide when you want to get in touch (if at all). Bombarding an ex boyfriend with pleas of getting back together makes you lose power and puts you in a vulnerable position. This is something you don’t need while feeling emotional and lonely. Finally, the no contact rule gives you a chance to reflect on the relationship which can help you to be forgiving in time. After a breakup, you’ll probably have mixed emotions of love and hate for various reasons. You’ll probably also be incapable of accepting an apology and being the bigger person at this time as well. Implementing the no contact rule will help you deal with any wrong-doing and eventually forgive if it is needed. After splitting up with your boyfriend, whether you want to get back together or move on, it’s a good idea to have a bit of time on your own. The no contact rule means disconnecting emotionally, apart from stopping all communication. Sometimes, a change of scenery will be needed to help accomplish this goal. Going on a vacation with your girlfriends is an excellent opportunity for regaining control and overcoming the emotional impact of the loss. It’s also a good idea to keep yourself busy. The more occupied you are, the less time you’ll have to think about calling your ex. You may want to start working out, take up a new hobby or even apply for a professional qualification course that you’ve always been interested in. A focus on personal development can be particularly empowering during this tough phase of your life. Finally, remember that although it may be tough going in the beginning, it will sooner or later get easier to resist the urge to call or text him. Experts believe that people need approximately 21 days of no communication to regain their emotional stability again after a breakup. However, this can be different for each person so the period may be shorter or longer, but it is usually around this length of time. With each passing day, however, you’ll feel that some weight has been lifted off your shoulders as you’re becoming stronger and capable of enjoying life once again. One of our writers and an experienced relationship coach and psychotherapist, Avelon McNae, has written a great article about the no contact rule and how to tell if he is missing you during this period. You can read the full article here.